As one of the lady pacers, it was an honor to be one of the supporters and believers of Livestrong Day 2011 held in BGC, Taguig City last October 2, 2011. We biked around Bonifacio Global City and some streets in Taguig City. It was an amazing experience to see runners and bikers joined to together not only to enjoy the event but to help the helpless cancer patients by donating small amount for the fight against cancer. Hoping there will be more Livestrong events next year. 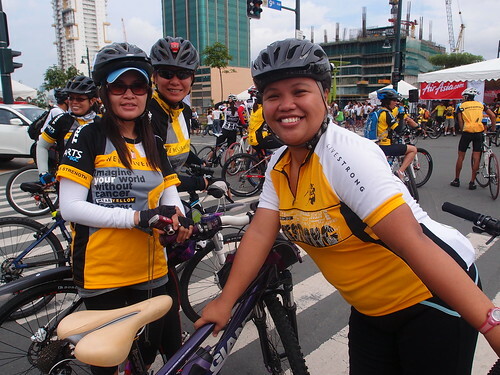 Congratulations to Livestrong Philippines, supporters and participants. More photos at Livestrong Day 2011 Photos by mtb.ph @ Flickr.